This year Wales becomes the only country in the world where you can walk along the entire coastline, a hike that stretches from Chepstow in the south to a spot near Queensferry in the north. Though officially completed in May, the Wales Coast Path will see improvements throughout the summer and fall to ensure that the route is safe and practical for the thousands of outdoor enthusiasts expected to visit Wales to experience this impressive 870-mile trek. I had the pleasure of hiking a portion of the Wales Coast Path during a recent sojourn in southern Wales. My group and I parked in a lot near an old stone church just north of the Gower Peninsula for a two-hour, 2.5 mile ramble along Three Cliffs Bay which took us through dune-dappled beaches, salt marshes, wildflower fields, limestone cliffs, and ruins of ancient castles (click here for details). The Gower, which spans west from the headlands of Swansea Bay, is home to 10 nature reserves, 24 Wildlife Trust reserves, 32 Sites of Special Scientific Interest and five Special Areas of Conservation. The Gower also has some of the best surfing in Wales, though the population here is unaccustomed to large numbers of tourists – they live quiet lives in small villages. Their most notable brush with fame, perhaps, is the fact that Welsh writer Dylan Thomas spent his later years in a boathouse just up the coast in Laugherne, the next stop on my itinerary. The lovely town of Laugharne was twice home to Dylan Thomas, who lived here from May 1938 until July 1940, and then from May 1949 until his death while on tour in the United States in November 1953. The white clapboard boathouse where Thomas lived with his wife Caitlin and their three children is set along a cobbled lane, jutting out over the Taf Estuary with its “heron-priested shore,” as Thomas wrote. (Laugharne is said to have inspired the fictional town of Llareggub in Under Milk Wood.) Unfortunately, the day we called upon the boathouse was a British bank holiday, so it was closed. Luckily, though, a friendly local walking his dog past the boathouse set the scene. He told us that the parlor inside had been restored to its 1950s likeness and that the upstairs houses photographs, manuscripts, and a short documentary about Thomas’ life. There’s also a café where visitors can enjoy traditional Welsh tea and baked goods, while up the path a ways is a simple shed where the scribe did most of his writing. Thomas and his wife are buried in a grave marked by a wooden cross in the yard of St. Martin’s Church in the northern section of Laugharne. The Dylan Thomas “loop” is part of the official 5-mile Coygen to Delacourse path along the Wales Coast Path, details of which can be found here. Those walking the Wales Coast Path should also keep their eyes out for the Welsh Rarebits: Hotels of Distinction collection an excellent group of hotels located in historic buildings (many with spas), where hikers can stay the night. 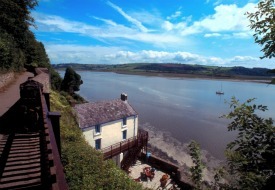 Not far from Laugharne in the Pembrokeshire Coast National Park, for example, is St. Brides Hotel in Saundersfoot, set above the seascape in an immaculately restored farmhouse. Though St. Bride’s retains touches of local charm – such as displaying the work of nearby artists on its lobby walls – it is also attuned to world-class luxury with its extensive wine list and huge infinity pool on the terrace overlooking a boat-filled harbor. So splendid is St. Bride’s, one might imagine it to be a suitable vacation spot for Prince William and his new bride, who’ve recently set up home on the nearby Isle of Anglesey. At last, the once shy sibling of England and Scotland has come into its own. For general trip-planning information see our Wales destination guide, then use our Travel Search price comparison tool to find the lowest rates and travel deals on flights, hotels, vacation packages, and more.